Passengers go to the Nanchang railway station in eastern China in February 2014, at the end of the Chinese New Year holiday. In the past, it was often the only time of year that migrant workers were able to return home. Now, economic pressures on factories in coastal China have led to a reversal of a decades-long migration of workers from inland to the coast. Zhang Zhaojun, 26, attends her brother's wedding with her boyfriend, Chen Ke. Zhao used to assemble computer motherboards in southern China. Now she's back home in Qichun, in Hubei province, making more money working as an accountant at a fertilizer factory. 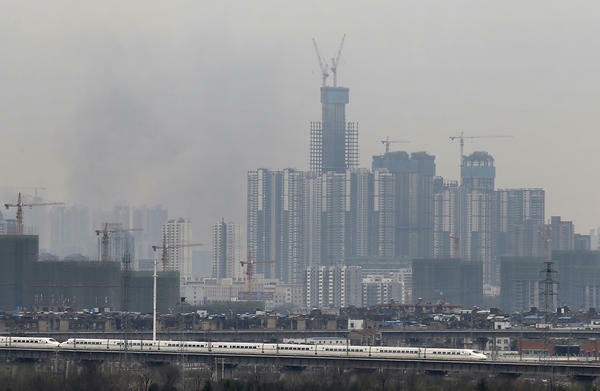 A bullet train runs past buildings under construction in Wuhan, in central China's Hubei province, Feb. 28. Factories are moving inland because of economic pressures — and migrant workers are following them. JoJo Gao, 25, studied dance while living in Shanghai. Now, she's back home in Qichun, running her own dance studio. Over the past couple of decades, a river of labor poured out of China's interior to its coasts as hundreds of millions of people traded farm for factory. Most improved their lives, but they paid for it in other ways, leaving behind families for a sometimes lonely existence. These days, though, more and more factories are moving from the coast into China's countryside, creating an opportunity for more workers to come home — workers like Zhang Zhaojun, who left the mountains of Hubei province in central China in 2009. Back then, there were few jobs, let alone careers, to keep her there. Zhang, a spunky young woman who stands about 5 feet 2 inches tall, roamed from city to city, finding work in a beauty salon, running a cash register at a karaoke parlor and assembling computer motherboards. "I worked day in and day out in the factory, and after a while I felt bored," she says. "I thought: 'Am I going to be like this when I grow old?' I don't want that." That was the life her father led for two decades. Zhang says he didn't return much, even for Chinese New Year, the nation's biggest holiday, when people traditionally head home to the countryside. "When I was little, I was afraid to call him 'Dad,'" recalls Zhang, now 26. "He felt very unfamiliar. There was no affection." While Zhang was away working, though, the economy of her hometown — a county seat called Qichun — took off. Factories that could no longer afford rising wages on the coast moved inland to cut costs. The city of 1 million now has factories that make tiles, electronics and health supplements. In 2013, Qichun's economy grew a whopping 10 percent. Zhang is back home in Qichun now, working as an accountant at a local fertilizer plant that opened recently. She makes more than $500 a month, more than she ever earned as a migrant worker. She is determined her kids won't grow up without a dad around, as she did. "Now, I'm pretty satisfied," Zhang says over lunch in a restaurant in Qichun. "But I think after I marry someone, there is no way that we will work in different cities." The factors driving the seemingly endless flow of migrant labor to the Chinese coast began to change about 10 years ago. Because of demographic shifts, the labor pool shrank. Wages naturally rose, margins tightened and low-end coastal factories went bankrupt or moved. 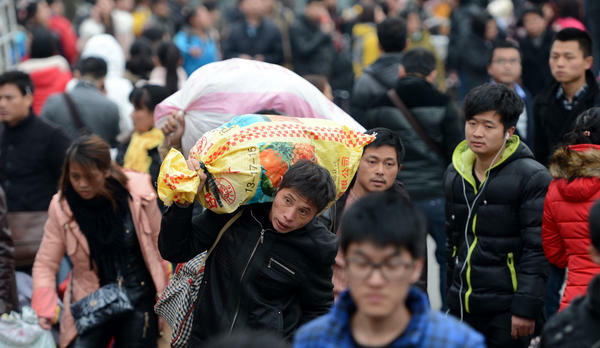 Today, more than half of China's migrants now work in their home provinces, according to the government. Zhang Jianfeng returned to Qichun two years ago after working on commercial property projects in Guangdong. While he was away, the real estate market in his hometown exploded. "In 2005, there were only two to three big apartment complexes, very few," he recalls. "Now, there are 30 to 40. In 2005, an apartment cost $64 a square meter; now it's more than $480 a square meter." Given his work experience, Zhang Jianfeng can now make double what he earned on the coast in a city where he knows lots of people. "Honestly speaking, if you make roughly the same amount of money and your family is here, of course it's better to work in your hometown," he says. As industry has migrated to low-wage areas throughout history, it has brought congestion and pollution. He says that's what happened in Qichun, which didn't have a lot of cars in the past. "Now you see the streets are all jammed during Chinese New Year and the air quality is much worse," he says. "In 2005, you could see stars at night. Now, you can only see a few unless it's a very clear sky." Most migrants seem happy to be back home, but some miss the more cosmopolitan life on the coast. 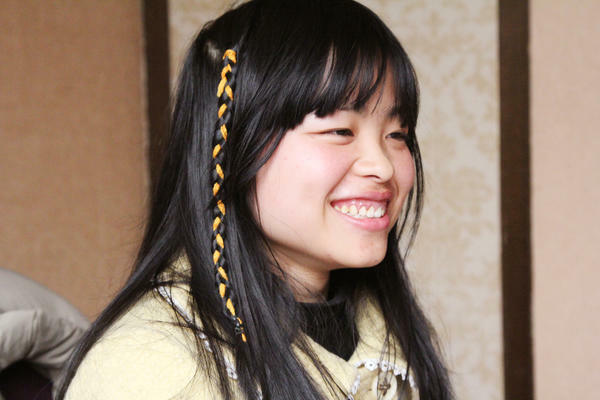 JoJo Gao worked giving facials at a beauty salon in Shanghai, where she made lots of foreign friends. She even attended an underground, Christian house church in a luxury residential compound a few blocks from the city's soaring skyscrapers. When she returned to Qichun — which got its first KFC last fall — she was a bit disappointed. "I feel now we have many shopping malls, lots of places that sell gold and silver jewelry, but there's nothing else," says Gao, 25, who is a gregarious bundle of energy. "Material life is abundant, but interest in spiritual life, health and fitness are almost nonexistent." That said, Gao plans to stay put. While in Shanghai, she made enough money to study her first love — dance — and learned jazz, ballet and belly dancing. Gao now runs her own dance studio in Qichun, where she teaches children on the weekends — an opportunity that was unthinkable when she was a child. Over the past couple of decades, hundreds of millions of people have left China's farms to work in factories on the coast. The goal was to build better lives, but it came with a cost - leaving behind families for a sometimes lonely existence. These days, more and more factories are moving from the coast into China's countryside and more workers are coming home. NPR's Frank Langfitt reports from Hubei province in central China. FRANK LANGFITT, BYLINE: Zhang Zhaojun left the mountains of Hubei 2009. There were few jobs, let alone careers, to keep her there. Zhaojun, who stands about 5'2", roamed the country, finding work in a beauty salon, running a cash register at a karaoke parlor and assembling computer motherboards. ZHANG ZHAOJUN: (Through interpreter) I worked day in and day out in the factory, and after a while, I felt bored. I thought am I going to be like this when I grow old? I don't want that. LANGFITT: It was the life her father had lived for two decades. ZHAOJUN: (Through interpreter) I felt like he rarely spent Chinese New Years at home. When I was little, I was afraid to call him dad. He felt very unfamiliar. There was no affection. LANGFITT: While Zhaojun was away working, though, the economy of her hometown, a county seat called Qichun, took off. Factories that could no longer afford rising wages on the coast moved inland to cut costs. In 2013, Qichun's economy grew a whopping 10 percent. Zhaojun is back home now working as an accountant at a local fertilizer plant that opened this week. And she's determined that her kids won't grow up without a dad around as she did. 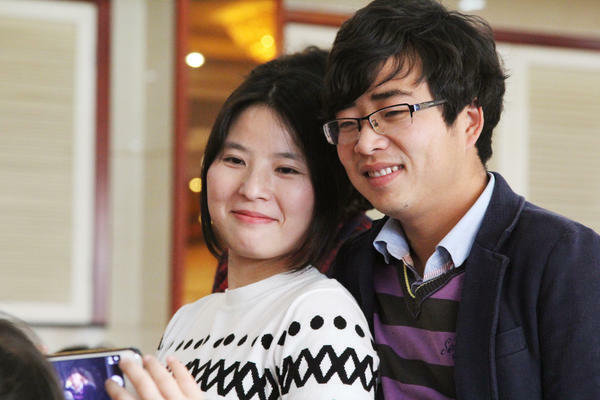 ZHAOJUN: (Through interpreter) Now I'm pretty satisfied, but I think after I marry someone, there is no way that we will work in different cities. LANGFITT: Chinese migrant workers began moving back home in the past decade. As wages rose and margins tightened, low-end factories on the coast went bankrupt or moved. I first stumbled upon this trend in 2008 while visiting a shoe factory on China's southern coast. Workers were breaking up the plant in Guangdong province and selling off equipment to other factories in China's interior. Seven years later, more than half of China's migrants now work in their home provinces, according to the government. Zhang Jianfeng came home to Qichun two years ago after working on commercial property projects in Guangdong. While he was away, the real estate market here exploded. ZHANG JIANFENG: (Through interpreter) In 2005, there were only two to three big apartment complexes - very few. Now there are 30 to 40. In 2005, an apartment cost $64 a square meter. Now it's more than $480 a square meter. LANGFITT: Given his work experience, Jianfeng can now make double what he made on the coast in a city where he knows lots of people. JIANFENG: (Through interpreter) Honestly speaking, if you make roughly the same amount of money and your family is here, of course it's better to work in your hometown than going out to work. LANGFITT: As industries migrated to low-wage areas throughout history, it's brought congestion and pollution. Jianfeng says that's what happened in Qichun, a city of about 1 million. JIANFENG: (Through interpreter) We didn't have a lot of cars here. Now you see the streets are all jammed during Chinese New Year, and air quality is much worse. In 2005, you could see stars at night. Now you can only see a few, unless it's a very clear sky. LANGFITT: Most migrants seem happy to be back home, but some miss the more cosmopolitan life on the coast. JoJo Gao worked giving facials at a beauty salon in Shanghai, where she made lots of foreign friends. She even attended an underground Christian house church in a luxury residential compound. When she returned, she found Qichun, which got its first KFC last fall, a bit disappointing. JOJO GAO: (Through interpreter) I feel now we have many shopping malls, lots of places that sell gold and silver jewelry. But there's nothing else. Material life is abundance, but interest in spiritual life, health and fitness are almost nonexistent. LANGFITT: But JoJo isn't going anywhere. While in Shanghai, she made enough money to study her first love, dance, learning jazz, ballet and belly dancing. JoJo now runs her own dance studio in Qichun, where she teaches children on the weekends, an opportunity that was unthinkable here when she was a kid. Frank Langfitt, NPR News, Hubei province. Transcript provided by NPR, Copyright NPR.